"How memory conspires with objects of human craft, pressing time flat, inciting a tender reminiscence." 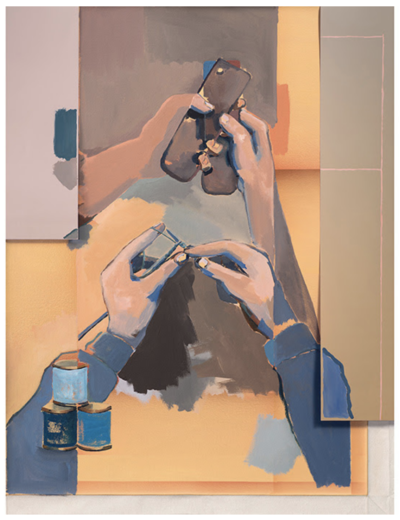 Marianne Boesky Gallery is pleased to present Holding Environment, an exhibition of new work by Los Angeles-based artist John Houck that highlights the artist’s deepening engagement with the expressive effects and conceptual possibilities of painterly gesture within his photography practice. Inspired by Houck’s temporary relocation to Portland, OR, in 2018, and his time spent living near family there for the first time since his formative years, the exhibition presents the artist’s explorations of memory, identity, and relational psychology. The exhibition will be on view from October 25 through December 22, 2018 at the gallery’s 507 W. 24th Street location. Holding Environment is the artist’s first presentation with the gallery in New York, following a solo exhibition at Boesky West, Aspen, CO, in summer 2017. Houck’s practice is distinguished by a deconstruction of accepted formal and conceptual boundaries. His intricate compositions hold both the profusion of detail inherent to photography and the fluidity and playfulness of painterly gesture. In this way, his works neither portray reality nor constitute fiction, but rather live in a liminal space where the object and form are defined by experience and personal understanding—much in the way that our memories can distort truth. Houck achieves this sensation through a process of re-photographing, in which he captures an object along with its image—sometimes many times over—introducing a multitude of perspectives and confusing the contours of the original. The effect is further accentuated by Houck’s introduction of painting within the cycle, adding an interpretative and emotive layer to the feedback loop of his photographic process. This experience is particularly heightened in Houck’s newest prints, as his engagement and use of painterly gesture becomes more incisive—intensifying both the optical and conceptual depth of his work. In some instances, Houck adds entirely new compositional elements in paint alone, and in others, he paints over fragments of photographs with marks that imply the layers of painting beneath the surface of the photograph. By further fusing the formal vocabularies and qualities of these two media into a single inextricable whole, Houck captures not only a moment or memory, but the mutability of each in the face of experience, perspective, and the passage of time. While Houck has always been interested in photography as a means of conjuring the past, his expansion into painting goes beyond both the monocular vision of the camera lens and the singular moment inherent in traditional photography. This effect feels particularly poignant in Houck’s Unstable Figure (2018), which will be featured in the upcoming exhibition. Here, Houck paints two identical bicycle handlebars, but renders the hands holding each from different perspectives, creating a dislocation of space in the overall composition. The work references Houck’s memories of time spent with his father and speaks to the childhood struggle of meeting familial expectations while also developing an independent identity—and conversely, the duality that can exist between the responsibilities of parenthood and the desire the maintain a sense of individuality. The instability of the image—created through the dynamic visual relationships between photo and paint—marks the collision of these conflicting experiences and the multiple remembrances of a single moment. The underlying conceptual thread is also a manifestation of Houck’s ongoing engagement with relational psychoanalysis—which focuses on the psychological importance of internalized relationships with other people. Many of Houck’s prior works have depicted mementos from his past, dug up from his childhood and given—or re-given—to him by his parents. Most recently, Houck has become attuned to the psychological theory of the "holding environment," which refers to the establishment of a supportive space. Likened to the nurturing behavior of parents toward their children, the idea has resulted in the creation of work that feels both deeply intimate and universally relatable. This exploration has been fueled by the birth of Houck’s first child, and his temporary move to Portland to be nearer family, bringing to the fore in his work a renewed investigation of memory and identity and concurrently spurring a new stage in his formal experimentation as he explores and plays with these personal reflections.